I gulped a big gulp when swiping the card for the Saeco Intellia. 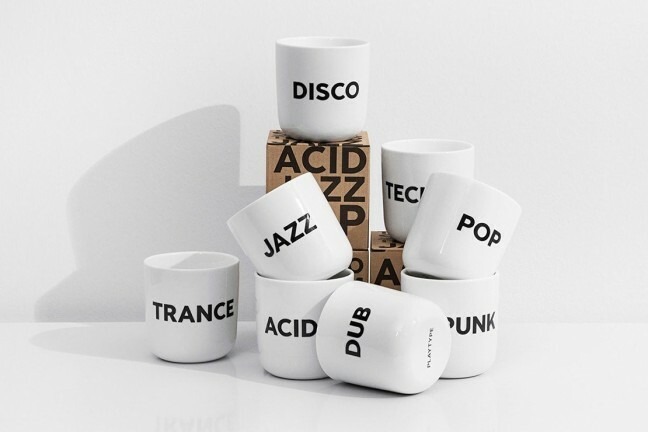 Now I gulp down a consistent cup of coffee each and every morning. I’m not a picky coffee person. I don’t know the difference between espressos and americanos. I’ve heard of a ristretto, but only recently heard the name. And my eyes were blown wide open when I tried a whiskey barrel pour over for the first time. In short, I’m not a coffee aficionado. But I’d be lying if I said I don’t enjoy my morning cup of coffee. In fact, it’s probably my favorite part of the day. There’s nothing quite like that first shot of caffeine after a dreary wakeup call. Where my coffee pickiness arises is in consistency and easiness. Morning routines aren’t routines if the coffee is strong one morning and weak the next. And, perhaps more importantly, bleary-eyed Josh doesn’t want to think about making that morning cup of Joe. 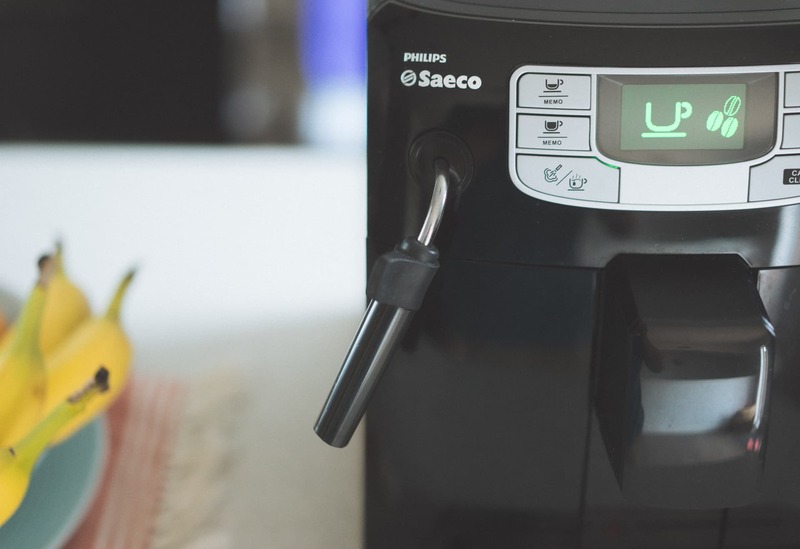 The Philips Saeco Intelia is an expensive coffee machine, but man, it makes an incredible cup of coffee. This is why the Philips Saeco Intelia sits on my countertop. 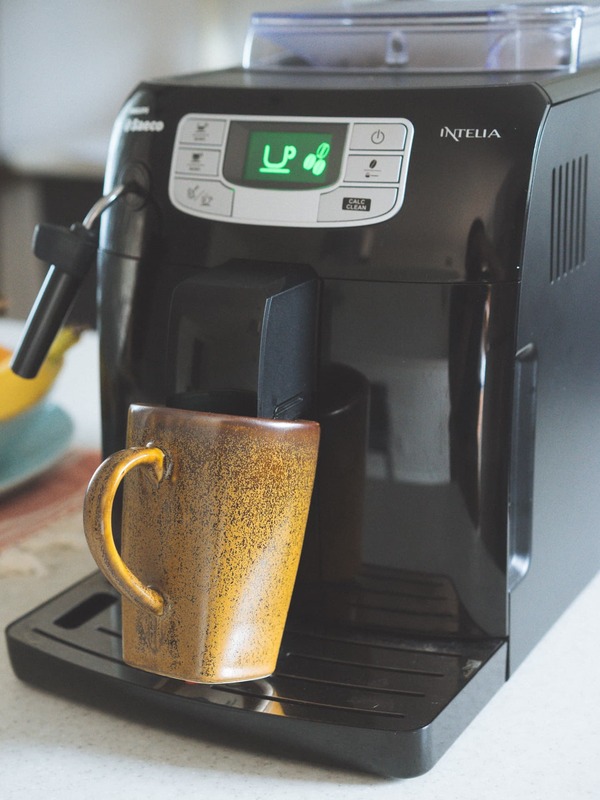 The Intelia is by no means a cheap coffee machine, nor is it made for those coffee connoisseurs reliant on all sorts of brew methods. The Intelia is an espresso maker, capable of perfect consistency with each button press, and all with absolute ease. Really, it shouldn’t be named the Philips Saeco Intelia — it should be named Josh’s Saeco Intelia. The Intelia’s sleek black lines and simple curvature put it right at home in our kitchen. It’s a fairly large and heavy machine that you won’t want to store in an appliance garage only to pull out each morning. Instead, like the KitchenAid across the kitchen, the Intelia has its own parking spot. From top to bottom: espresso brew, standard brew, and pannarelo options. 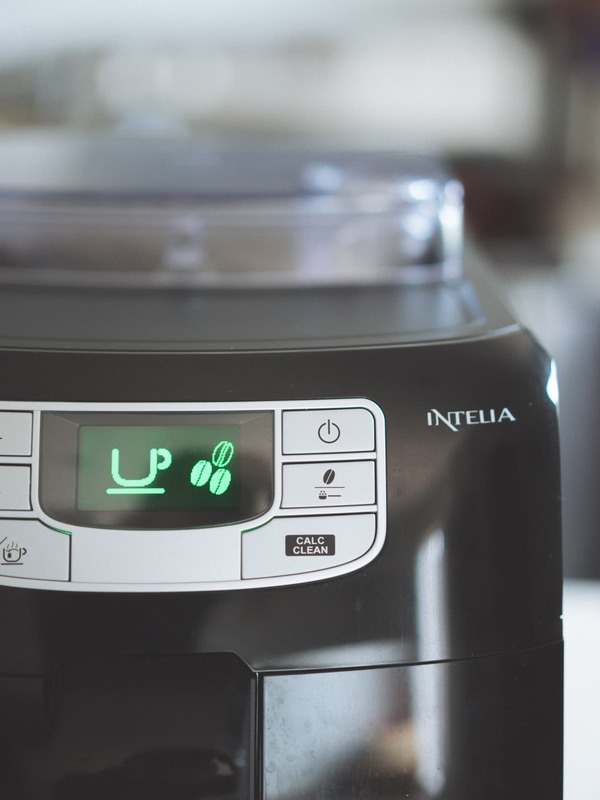 The front of the Intelia is simple enough — six mushy buttons are set apart by a retro-looking green LED that displays the Intelia’s range of settings. On the left are the Intelia’s brew options: the top and middle buttons are for two customizable brew methods, and the bottom button activates the pannarelo (the milk frother). From top to bottom: power, brew strength, and the decalcifier process. On the right of the display is the power button, a button to change the Intelia’s brew strength, and a button to start the decalcifying process. As a whole, there is little to be afraid of on the Intelia’s face. The spout is adjustable, but still doesn’t sit high enough to brew into larger mugs. Below the display and button panel is the Intelia’s actual brewing console: two, single stream spouts that are built inside an adjustable compartment. This compartment can be moved up and down to accommodate for larger cup sizes, but even the highest setting isn’t high enough for bigger mugs. 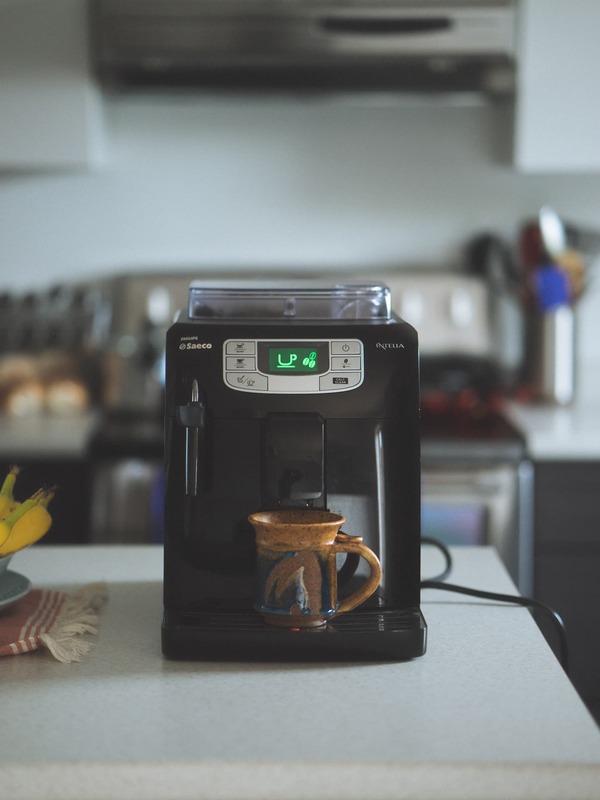 This low brewing console effectively eliminates the ability to brew straight into a travel mug and instead forces you to brew into a separate cup before pouring into your travel mug of choice. The manufacturer claims the lower console is to help keep your coffee hot during the brewing process, but I think the quick boiler is impressive enough to allow larger cups to fit underneath. On both sides of the adjustable spout are two reservoirs for fresh water and used coffee grinds. The water reservoir is made of clear, hard plastic and has a small filter built into the bottom to improve the cleanliness of your water. I use straight tap water all the time. Unfortunately though, the reservoir is a bit small for my liking. Between left over water spilled into the bottom tray and the actual brewing process, I can get about four to five cups of coffee per reservoir. This isn’t bad, but I find I’m constantly refilling the reservoir before hitting the brew button. On the right is the used grinds compartment. After the brewing process is complete, the used grind puck is jettisoned into the compartment and a nice red notification pops up on the display when it’s time to empty. This compartment can get pretty dirty, but because it’s made of hard plastic, it’s super easy to clean and rinse out. That being said, like the water reservoir, I often pull out the grinds compartment and wonder why it can’t hold more. It’s a small nuisance, but a nuisance nonetheless. I’ll admit, I’m far from a barista and the pannarelo is a foreign tool to me. One day, I may understand it. For now, it just gets in the way of pulling out the water reservoir for a refill. 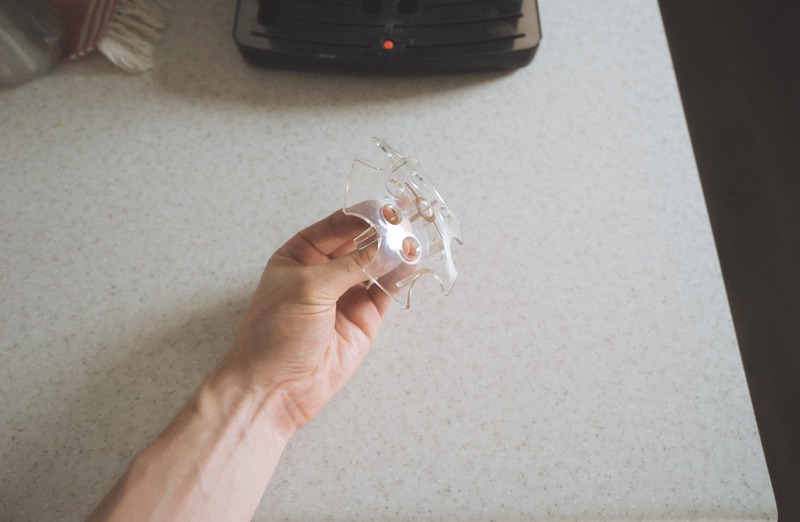 A quick word of caution: When using the pannarelo, make sure to avoid bare-skin contact with the small piece of exposed metal. This metal gets extremely hot and I’ve burnt myself a few times when experimenting in the past. Just above the water reservoir is the pannarelo, activated by the bottom-most button on the left button panel. I’m not much of a barista (if any at all), but I’ve never been disappointed with its steamed milk. If you’re not a barista like me, the pannarelo also shoots out boiling water for a nice cup of tea or hot chocolate. Just be sure to avoid the exposed metal portion of the pannarelo — it gets extremely hot and I’ve burnt myself a few times by accident. The right side of the Intelia opens up to the actual brew group inside. The entire group can be removed and rinsed out, making maintenance quick and easy. The entire right side of the Intelia is a large door that is easily opened to expose the machine’s actual brewing contraption. 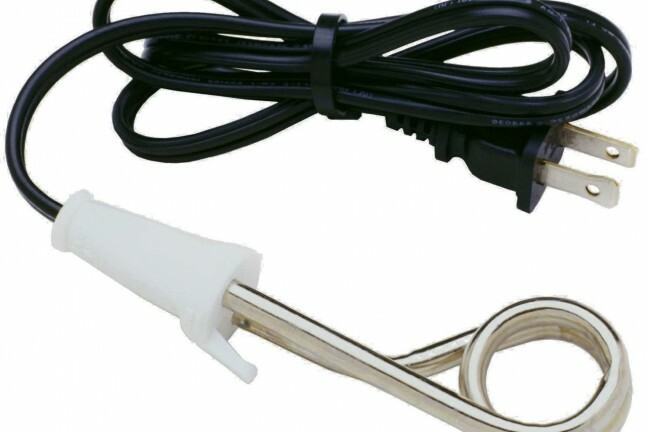 The contraption can be removed entirely from the machine and can quickly be rinsed in the sink. This could be one of the easiest machines to clean that I’ve ever tried, and it’s all thanks to this removable contraption. A power button and a plug-in are on the Intelia’s backside. That’s it. The back side of the Intelia is simple and boring, really. All you’re met with is the power outlet and an on/off switch. The bottom of the Intelia is no different; the spill tray keeps left over water off your counter and has a floating orange indicator to tell you when to empty the tray. The drip tray keeps all the leftover water from messing up your countertop. Unfortunately, the stainless steel top scratches very easily. As it turns out, the Intelia is as much about design as it is about consistency. 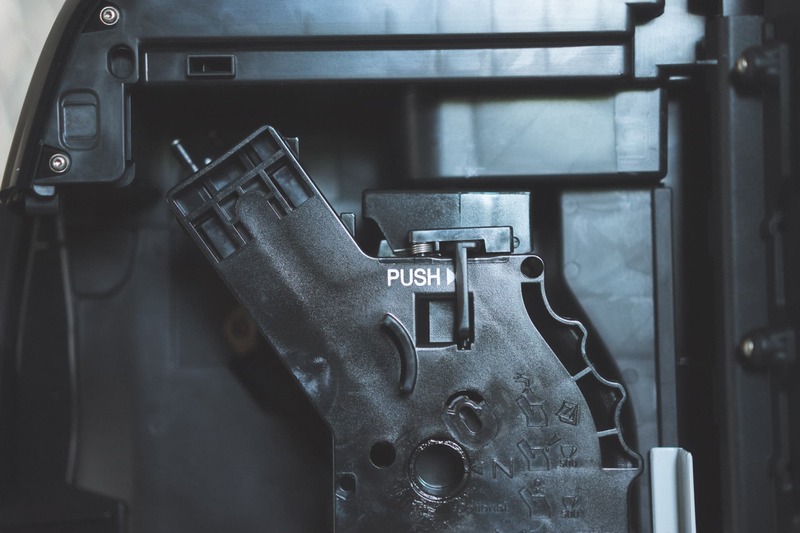 There are only six buttons to press, ensuring the machine is easy to setup and use within seconds. Both the water reservoir and the used grinds compartment are seamlessly built into the Intelia’s body, as is the wonderfully easy-to-clean brewing contraption inside the Intelia. I appreciate how such a powerful, advanced machine has no superfluous features hanging off its sides. I left the Intelia’s topside for the How it Works section because this is where the Intelia’s magic begins. The machine’s first steps are to clean itself before getting to the nitty gritty. There is a cleaning process before the Intelia enters standby mode and there is a cleaning process after the Intelia exits standby mode. This ensures only fresh water is used for your cup of coffee. First, you hit the power button. The Intelia has many features packed into it, and the first is the Intelia’s self-cleaning system. Pressing the power button pushes the Intelia into ridding itself of leftover, stale water caught in the machine’s veins. While it ejects the bad water, the Intelia also uses its quick heat boiler to rapidly pull water from the reservoir and prepare it for brewing. I still question how I can pour cold water from the faucet into the reservoir to having boiling water only 30 seconds later. It’s remarkably quick. 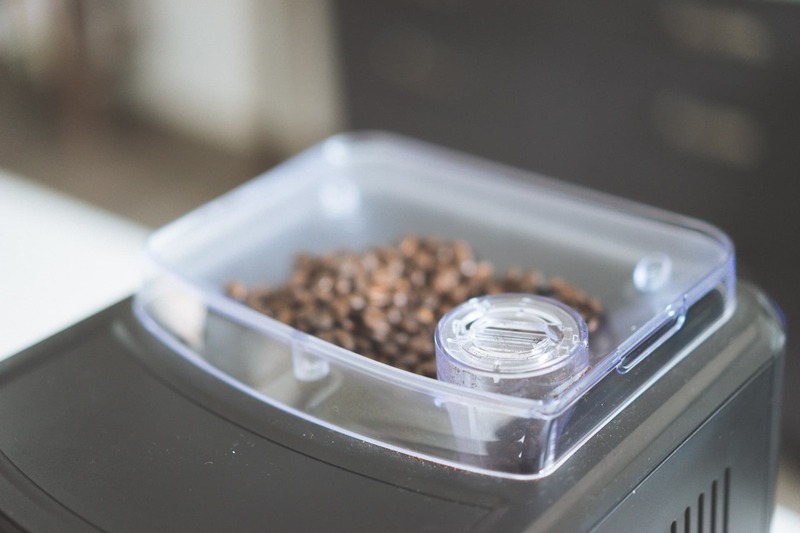 Unlike the water reservoir and used grinds compartment, the grinder up top has plenty of space and holds a substantial amount of beans. 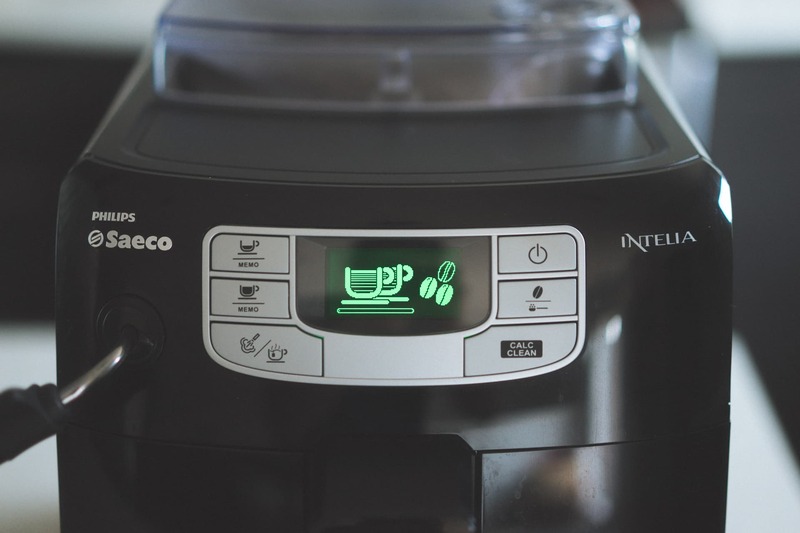 Once the machine is ready to go, it’s time to dump your favorite beans into the Intelia’s top bean grinder. The first thing I did after removing the machine from the box was remove the safety guard in the grinder. The guard causes the grinder to clog up and it takes up a lot of space. Proceed at your own caution, but I just make sure I don’t have my hands anywhere near the grinder when I push the button. Out of the box, the Intelia has a hard plastic safety guard screwed into the grinder that both clogs the grinder and takes up tons of space. The specialist I purchased the machine from recommended removing the safety guard and to re-screw in the bolt. There is a sensor inside that won’t let you brew unless the bolt is reapplied. 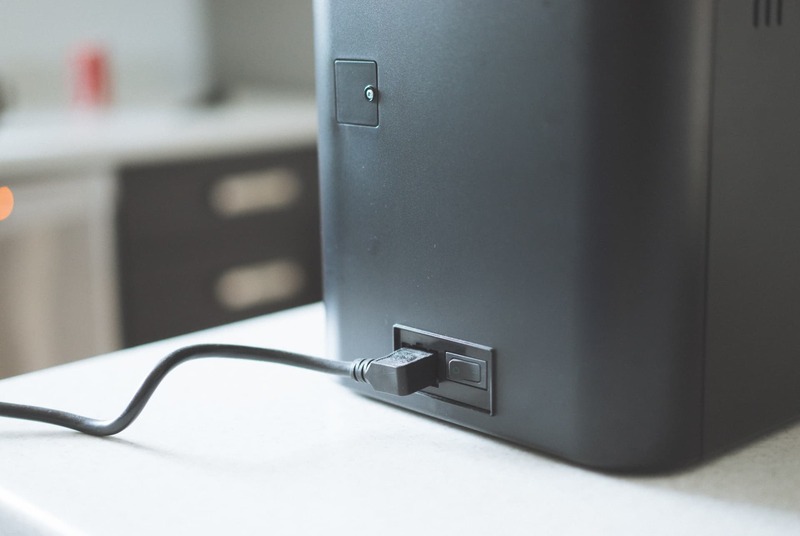 It’s a workaround, and one that you have to do at your own risk, but it’s eliminated any issues I’ve had with the grinder and it eliminates many of the bad reviews you can find of the Intelia on Amazon. Mine is set to the default medium grind, but as my taste buds evolve, I’m finding I like finer and finer grinds. If you want a very specific grind that can come only from a dedicated grinder, you can insert the grinds directly into the chute on the front right. Just make sure you use the middle button on the right panel to cycle to the pre-ground option. 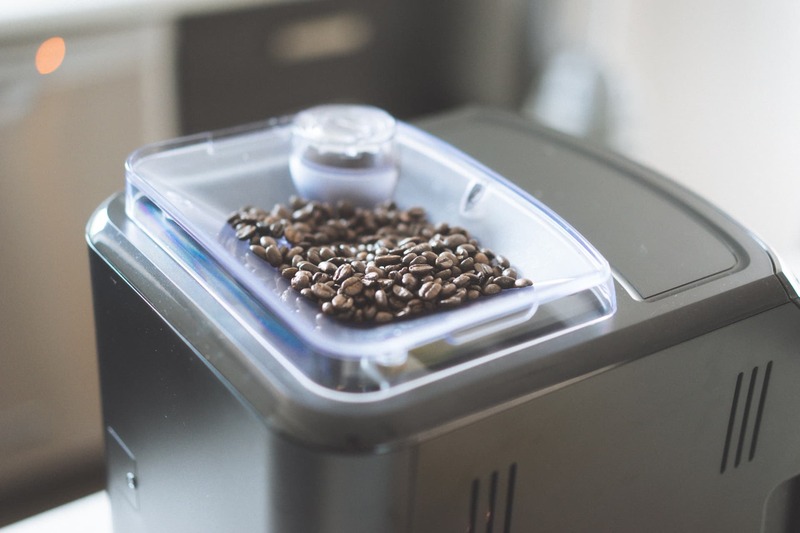 If the Intelia doesn’t have your grind of choice, you can pre-grind your own beans and insert your grinds directly into the tube beside the built-in grinder. Once you insert your own grinds, be sure to hit the button below the power button on the top panel to ensure the Intelia knows you are using your own grinds. Beans are in or grinds are inserted? Good. Next, hit one of the two brewing buttons on the top left panel and you’re off to the races. That’s it. The Intelia roars to life and proceeds to grind your beans to the grind setting, funnel them into an espresso puck where boiled water is pushed through and into your cup below. The grind is fairly noisy and generally wakes my wife up first thing in the morning. 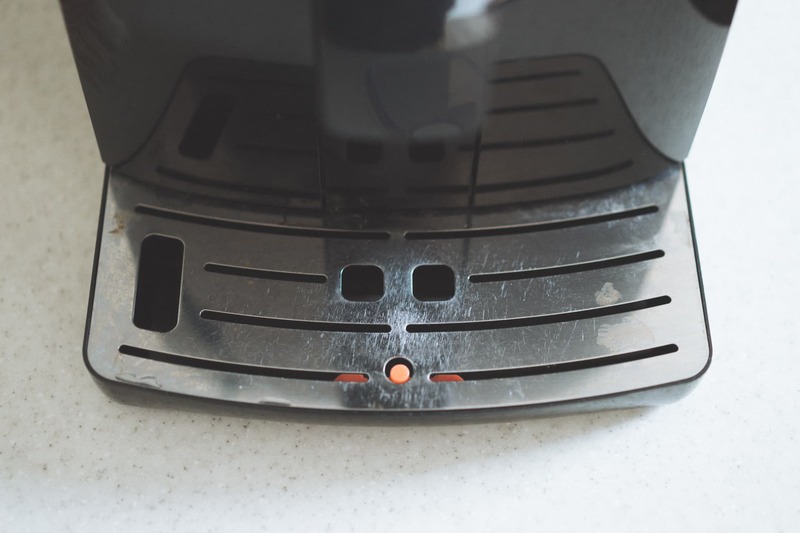 You can help quiet some of the sound by putting the lid on top of the grinder (this is also a nice safety precaution seeing as we’ve removed the actual safety guard). Once the brew process is complete, the puck is jettisoned into the grinds compartment. And your taste buds can enjoy the most consistent cup of coffee ever. 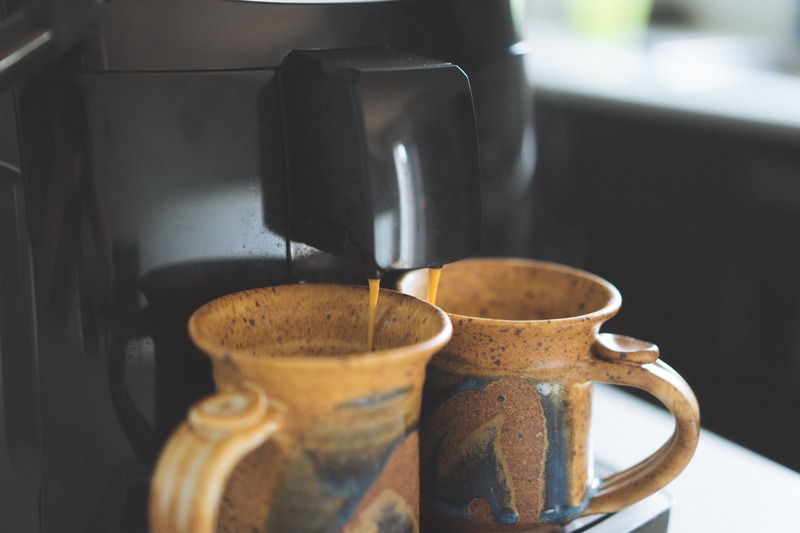 If you have company over, brewing two cups of coffee is as simple as pressing the brew button twice. The machine goes through the grind and brew process twice on its own. Press the button twice and walk away. It’s that easy. On the left, you can see how the Intelia brews two cups of coffee at once. The spouts are positioned fairly close together, so you have to make sure the cups are aligned properly to avoid losing coffee brewing into the drip tray. 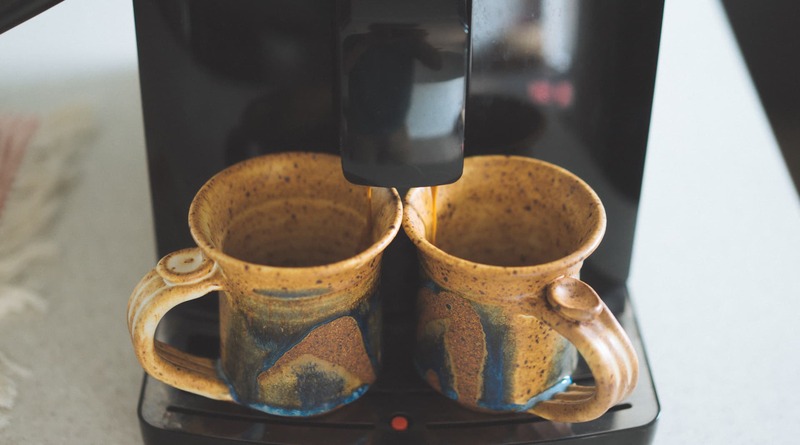 Do you need to brew two cups of coffee for yourself and a guest? Easy. Place a cup under each spout and press the brew button twice. The Intelia goes through the brewing method twice on its own — first, a grind, second, a brew, and third, jettisoning the puck. Wash, rinse, repeat. You can take things one step further: both brew buttons are customizable. It’s very easy to follow the manual to precisely set how much water you want pushed through the grind puck. 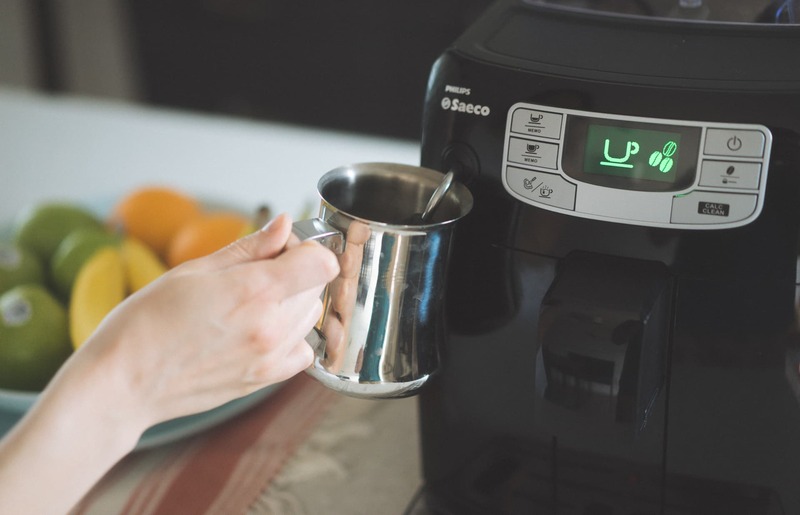 On my Intelia, the top brew button is set for a quick shot of espresso — perfect for a cappuccino — and the middle button is set for a standard 8 oz. cup of coffee. I wish you could see the look on my face as I write about the Intelia’s incredibly easy process. I love how I can roll out of bed, wander aimlessly across the house, and hit a single button for a perfectly consistent cup of coffee. It’s the same routine every morning. Hit the button and guzzle the cup of coffee. Then, depending on how tired I am, maybe I hit the button a second time. It’s so easy, a non-coffee-aficionado like me can do it. The Intelia’s raison d’être is not ease of use, but consistency. Each process and feature built into the machine is designed to ensure each cup of coffee is identical. As mentioned, the Intelia’s greatest asset working towards a consistent cup of coffee are its self-cleaning processes. And to me, the Intelia’s consistency begins and ends with the self-cleaning process. As mentioned, the Intelia turns on and ejects stale, unused water from the prior brew. It also makes sure to enter standby mode (all on its own, might I add) by pulling a little water from the reservoir to clean the system. This might explain why the Intelia goes through so many water refills, but it ensures no silty water is left in the system during standby mode. The Intelia’s lines never get clogged up and only fresh water is used to brew. It goes a step further in the decalcifying process. After so and so many brews, the Intelia notifies you of the need to enter the decalcifying process. 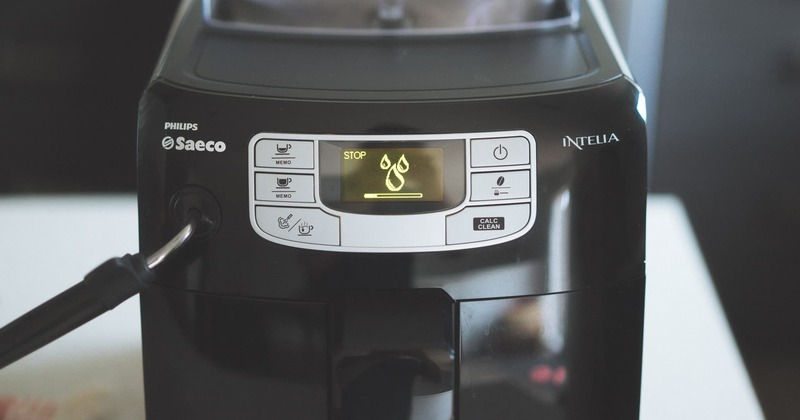 Simply dump in some decalcifying solution (I use half of a Keurig 2.0 descaling solution because it’s what is available at the store; the manual recommends you use actual Saeco solution, which is far more money and less readily available), hit the button, and let the Intelia clean itself. This is where the Intelia’s fundamental consistency is found. The machine is always clean. If it’s not, it asks to be cleaned. 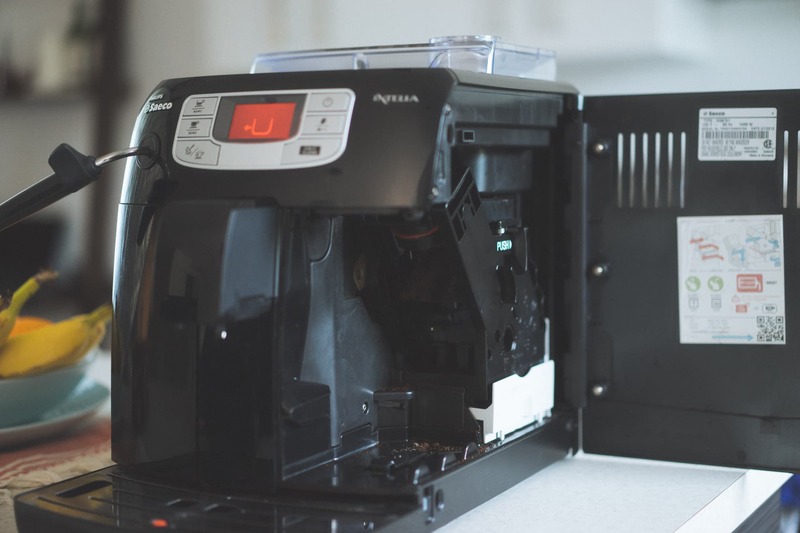 Just a little maintenance every month ensures the machine works just like its first day out of the box, which in turn ensures a consistently smooth cup of coffee. Aside from the small reservoirs I complained about earlier, there is only one other aspect worthy of complaint: price. The Intelia isn’t a cheap coffee machine. It’s an $800 premium coffee machine. I can imagine this price tag would cause at least a few eyebrows to raise. But it isn’t very hard to justify such a price tag after a little thought and consideration. Here in Canada, the de facto coffee option is a “double-double” (two cream, two sugars) from Tim Hortons. Tim’s hasn’t succeeded south of the border, but every little community north of the border has its own Tim Hortons brimming with coffee drinkers. A large double-double runs you $2, and I know many people who purchase a $2 double-double each day. If, like me, you have to have your cup of coffee each morning, it would only take just over a year for the Intelia to pay for itself. And the kicker is the fact the Intelia’s brew wipes the floor with a double-double. Consider also the lifetime of a machine like the Intelia. 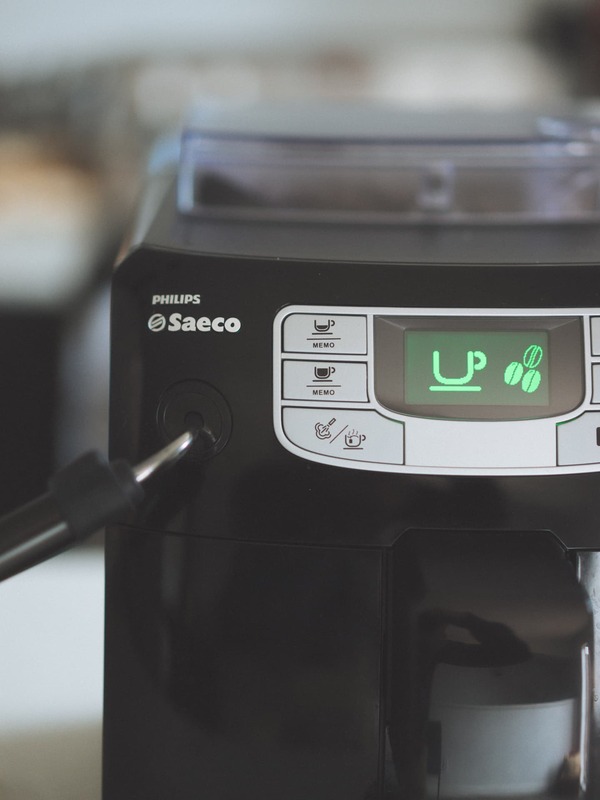 My boss has a Saeco machine of his own that has brewed cups of coffee for well over six years. In comparison, my wife and I purchased a Keurig machine and it kicked the bucket about a year later. Right off the top, $800 is a tough pill to swallow. 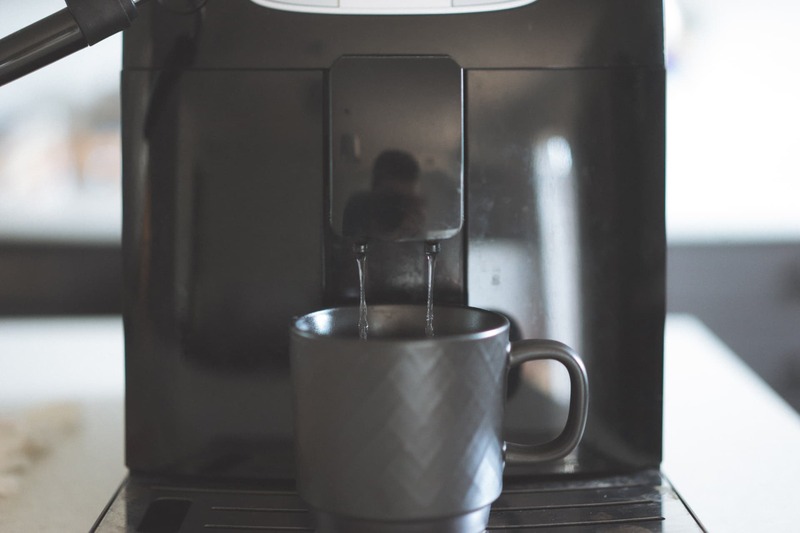 But when you consider how expensive coffee can cost with daily trips to Starbucks (or Tim Hortons) and when you consider the durability of a premium machine, that $800 starts to look like a bargain. I have an abnormal love for my Saeco Intelia. I’ve reviewed many things on Tools & Toys over the last year and a half, but none of those products surpass the Intelia in terms of quality and ease of use. The Intelia is the beginning of my day, and without it, I’m not sure what kind of Josh walks out the front door for the office. I have to acknowledge the price a third time though. 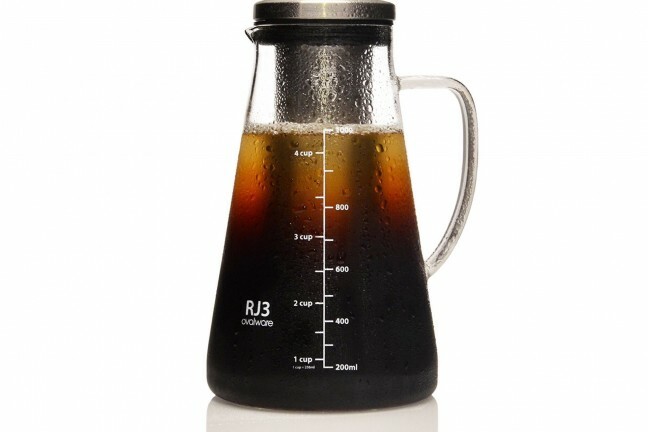 You can’t just shrug off the $800 price tag, as this is, at best, a luxury-like product; you can get perfectly fine coffee at the local coffee shop or from less expensive machines. Yeah, it’s an expensive coffee machine. Maybe I’m spoiled. Regardless, I love the Intelia. It’s easily my favorite kitchen appliance and I’d buy another one if mine ever brewed its last cup. What does $800 buy you? It buys you the most consistent cup of coffee I’ve ever come across. It’s the exact same thing, each and every morning. 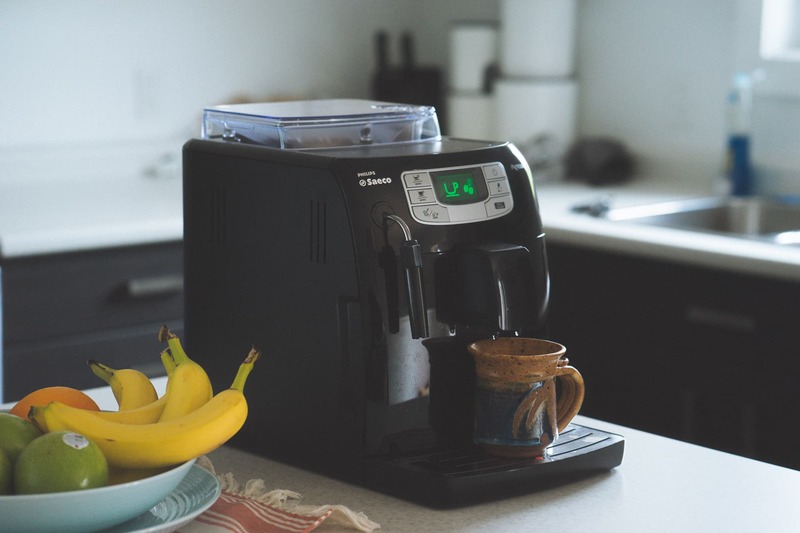 $800 also buys you a long life with appropriate maintenance, extra capabilities like the trusty pannarelo, incredible one-button-press ease of use, and a wide range of grinds, brew strengths, and customization. I gulped a big gulp when swiping the card for the Philips Saeco Intelia. I wasn’t sure if I’d be looking at a wonderful morning routine, or the largest lemon in my kitchen. 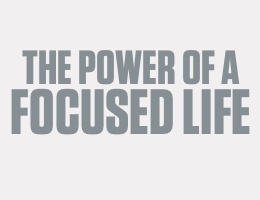 Instead, I now gulp down an incredible cup of coffee each and every morning.